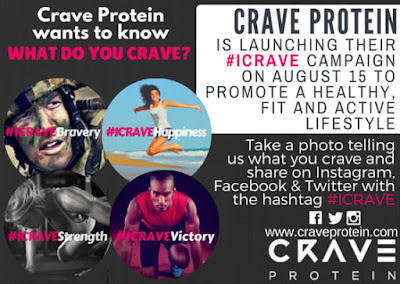 Living a Fit and Full Life: Crave Protein wants to know What do You Crave? To Promote a healthy, fit and active lifestyle join Crave Protein to promote their #ICRAVE Campaign! Never had this kind, I'll have to look into it! This is intriguing, I need to look into it. My husband is always looking for good protein products. I'm not familiar with Crave protein, but my brother is into products like this. I am going to ask him if he's ever heard of it. I crave sweets :D Definitely info I will share with my husband he is into all that protein stuff. I crave health and sweets - my problem is trying to balance it.